LASIK surgery is becoming an increasingly popular and effective method of vision correction, which is primarily used to fix the most common types of vision problems - namely, nearsightedness, farsightedness, and astigmatism. As a safe and long-term solution to gaining clearer eyesight, it stands to reason why LASIK has become a satisfying option for many people. However, before choosing LASIK surgery, patients must first be evaluated for candidacy. ​​​​​​​When you visit our Baltimore eye care center for a pre-operative exam, you and your doctor will gain insight into the specific nature of your vision impairment and whether LASIK is a viable treatment method for you. In order to better understand what this examination entails, refer to the following explanations of the standard diagnostic tests. Your potential LASIK surgery will be tailored specifically to the shape of your eye and its vision. Therefore, the optometrist must gather a few crucial pieces of information to this end. One test, called a computerized topographical analysis, will be used map the front and back surfaces of the cornea as well as its thickness. This will help identify any irregularities of the eye, and will determine whether the cornea is thick enough to be safely resurfaced. This test may also be coupled with a pachymetry, which will further analyze the cornea's thickness. In addition to the physical dimensions of the eye's surface, the doctor will also measure the refractive error of a patient's vision. This is performed like a traditional vision exam, wherein a patient's current vision will be compared with his or her prescription. Ideally, your vision should be stable for at least a year before LASIK surgery can be performed. If you regularly wear contacts, your doctor will likely suggest that you stop wearing them for a specified period of time prior to these tests. A “wavefront” is the way in which light passes through the eye. With perfect vision, the wavefront image of this light would be relatively flat, since the light is not obscured or distorted in any way. But with the multitude of varying vision problems among patients, as many as 60 different wavefront forms may arise during analysis. 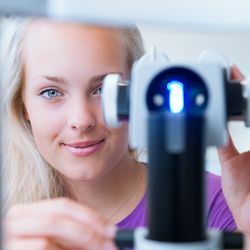 By analyzing how light passes through your eye, the optometrist can create an accurate treatment plan that targets the exact abnormalities with your eye and its vision. Most patients with conventional vision problems are good candidates for LASIK, but certain eye conditions may limit one's candidacy. Pupil size is one such factor, since patients with large pupils are more likely to experience permanent visual side effects after surgery, such as halos or glares at night. Similarly, patients who regularly suffer from dry eyes may have this condition exacerbated by surgery, resulting in continued discomfort or inconvenience. Therefore, your doctor will examine both the size of your pupils and effectiveness of your eyes' tear production, which will give you a better idea of what to expect after treatment. Intraocular evaluation: The back of the eye will be analyzed for retinal diseases or problems. If any are detected, these problems should be treated separately, prior to LASIK surgery. External ocucular evaluation: The front of the eye and its surface will be examined for any disease such as conjunctivitis or genetic corneal diseases. Eye pressure analysis: Abnormal eye pressure may be an indication of glaucoma, and will therefore be tested. In addition, LASIK surgery is likely to affect eye pressure, so the doctor must make sure initial pressure is within an acceptable range. Eye dominance test: Some patients are given an option to under-correct their non-dominant eye, allowing them to see at close distances without the need for reading glasses. This option will be discussed with your doctor after a dominance test, most often for patients who are 40 years or older. Wet refraction test: Some patients experience changes to their vision after their pupils are dilated. By taking note of this in an initial exam, the treatment can be modified accordingly. Even before you undergo these tests, an initial consultation must be scheduled with your optometrist. By discussing your goals for treatment and your medical history, you and Dr. Goel can determine whether LASIK is a good option. Contact our office to schedule your first visit.